Below is a sample article of what could be posted during the season. We plan on making a separate page with The Hoop Vision Playbook to archive various X’s and O’s. We will feature overall basketball concepts, teams, and players. The below example is a mixture of a team (Utah State) and a player (Jared Quayle). Moving Without the Ball: Jared Quayle and Utah St.
Utah St. has been an extremely efficient offensive team recently under Coach Stew Morrill. In the last three years, Utah St.’s AdjO have ranked 18, 17, and 44 (from most recent to oldest) nationally. Their offensive scheme is excellent and they have had the right players to execute. Recent graduate Jared Quayle did a great job of moving without the ball. Below are three examples of Quayle and the Aggies during the NCAA Tournament against Texas A&M. Click on images for better views. This first play is extremely simple yet effective. Quayle passes the ball to the high post and then gets a screen from the opposite high post. If the defender tries to stay right with Quayle and fight through the screen, then Quayle looks backdoor. However, Quayle was able to pop to the wing for a (successful) three. The second play starts with Quayle on top handling the ball. He passes to the wing, who dribbles to the top. Quayle then replaces the spot where he just passed. Next, Quayle screens down on the low block. The next step uses the “screen for the screener” concept. Quayle’s man is naturally focused on the player Quayle just screened for. Quayle comes off the screen to the wing for an efficient three, but in this case the shot rims out. The final play is off a baseline inbounds. Quayle starts on the block and screens up for option number one. 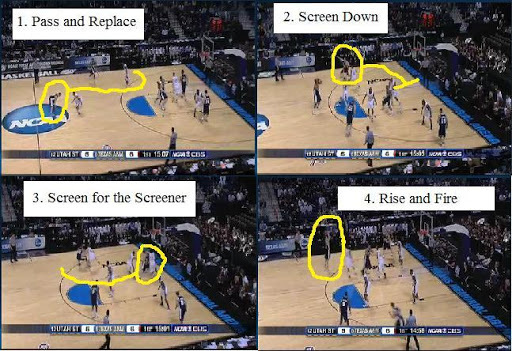 Although unlikely, an easy lay-up would be the ideal result of the initial screen. The next step is a double screen for the screener. Quayle comes off both screens perfectly and forces not only his man to chase but also one of the defenders guarding a screener. Quayle’s jump shot is not open, but he hits his teammate who correctly pops out upon realizing his defender has gone to double team. 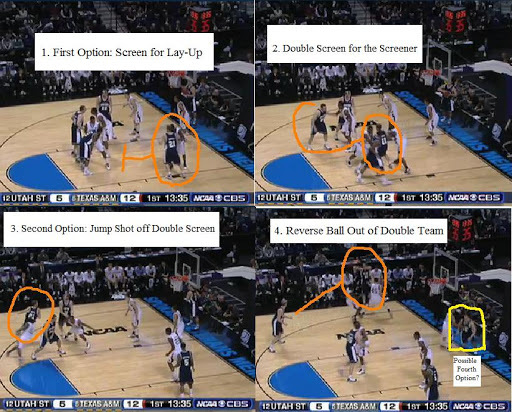 However, another high percentage jump shot is missed in this sequence (a theme during the A&M game). Utah State did not get the result they would have liked in the first round of the NCAA Tourney, but it wasn’t from lack of execution. Unfortunately for Quayle and the Aggies the shots didn’t fall. Stew Morrill’s team will be relevant again in 2010-2011. The only senior from last year was Quayle, not to mention the arrival of JUCO All-American Antonio Bumpus. Tags: Introduction Jared Quayle Playbook Utah St.